"La Résistance" and "Résistance" redirect here. For other uses, see La Résistance (disambiguation) and Resistance movement. French resistance partisans fought alongside Allied troops to retake their cities (staged photograph). 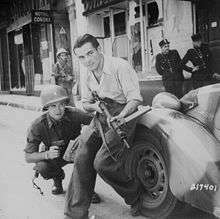 The French Resistance (French: La Résistance) was the collection of French resistance movements that fought against the Nazi German occupation of France and against the collaborationist Vichy régime during the Second World War. Résistance cells were small groups of armed men and women (called the Maquis in rural areas), who, in addition to their guerrilla warfare activities, were also publishers of underground newspapers, providers of first-hand intelligence information, and maintainers of escape networks that helped Allied soldiers and airmen trapped behind enemy lines. The men and women of the Résistance came from all economic levels and political leanings of French society, including émigrés; academics, students, aristocrats, conservative Roman Catholics (including priests) and also citizens from the ranks of liberals, anarchists and communists. The French Resistance played a significant role in facilitating the Allies' rapid advance through France following the invasion of Normandy on 6 June 1944, and the lesser-known invasion of Provence on 15 August, by providing military intelligence on the German defences known as the Atlantic Wall and on Wehrmacht deployments and orders of battle. The Résistance also planned, coordinated, and executed acts of sabotage on the electrical power grid, transport facilities, and telecommunications networks. It was also politically and morally important to France, both during the German occupation and for decades afterward, because it provided the country with an inspiring example of the patriotic fulfillment of a national imperative, countering an existential threat to French nationhood. The actions of the Résistance stood in marked contrast to the collaboration of the French regime based at Vichy, the French people who joined the pro-Nazi Milice française and the French men who joined the Waffen SS. After the landings in Normandy and Provence, the paramilitary components of the Résistance were organised more formally, into a hierarchy of operational units known, collectively, as the French Forces of the Interior (FFI). Estimated to have a strength of 100,000 in June 1944, the FFI grew rapidly and reached approximately 400,000 by October of that year. 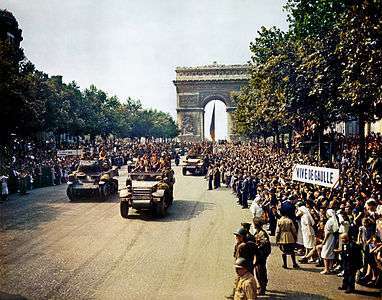 Although the amalgamation of the FFI was, in some cases, fraught with political difficulties, it was ultimately successful, and it allowed France to rebuild the fourth-largest army in the European theatre (1.2 million men) by VE Day in May 1945. Following the Battle of France and the second French-German armistice, signed near Compiègne on 22 June 1940, life for many in France continued more or less normally at first, but soon the German occupation authorities and the collaborationist Vichy régime began to employ increasingly brutal and intimidating tactics to ensure the submission of the French population. Although the majority of civilians neither collaborated nor overtly resisted, the occupation of French territory and the Germans' draconian policies inspired a discontented minority to form paramilitary groups dedicated to both active and passive resistance. One of the conditions of the armistice was that the French pay for their own occupation; that is, the French were required to cover the expenses associated with the upkeep of a 300,000-strong army of occupation. This burden amounted to approximately 20 million German reichsmarks per day, a sum that, in May 1940, was approximately equivalent to four hundred million French francs. (The artificial exchange rate of the reichsmark versus the franc had been established as one mark to twenty francs.) Because of this overvaluation of German currency, the occupiers were able to make seemingly fair and honest requisitions and purchases while, in effect, operating a system of organized plunder. Prices soared, leading to widespread food shortages and malnutrition, particularly among children, the elderly, and members of the working class engaged in physical labour. Labour shortages also plagued the French economy because hundreds of thousands of French workers were requisitioned and transferred to Germany for compulsory labour under the Service du Travail Obligatoire (STO). The labour shortage was worsened by the fact that a large number of the French were also held as prisoners of war in Germany. Beyond these hardships and dislocations, the occupation became increasingly unbearable. Onerous regulations, strict censorship, incessant propaganda and nightly curfews all played a role in establishing an atmosphere of fear and repression. The sight of French women consorting with German soldiers infuriated many French men, but sometimes it was the only way they could get adequate food for their families. As reprisals for Résistance activities, the authorities established harsh forms of collective punishment. 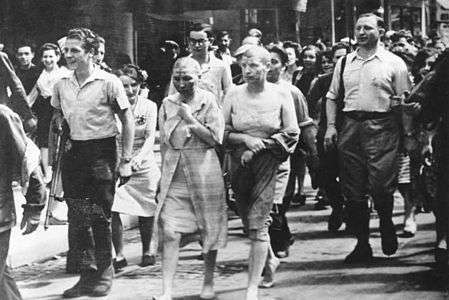 For example, the increasing militancy of communist resistance in August 1941 led to the taking of thousands of hostages from the general population. A typical policy statement read, "After each further incident, a number, reflecting the seriousness of the crime, shall be shot." 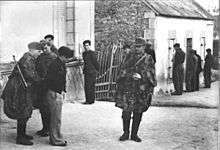 During the occupation, an estimated 30,000 French civilian hostages were shot to intimidate others who were involved in acts of resistance. 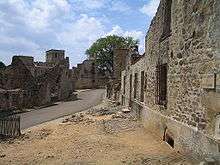 German troops occasionally engaged in massacres, such as the destruction of Oradour-sur-Glane, where an entire village was razed and the population murdered (save for a few scant survivors) because of persistent resistance in the vicinity. 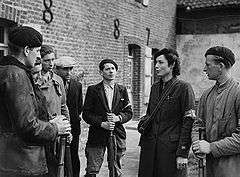 In early 1943, the Vichy authorities established a paramilitary group, the Milice (militia), to combat the Résistance. They worked alongside German forces that, by the end of 1942, were stationed throughout France. The group collaborated closely with the Nazis, and was the Vichy equivalent of the Gestapo security forces in Germany. Their actions were often brutal and included torture and execution of Résistance suspects. After the liberation of France in the summer of 1944, the French executed many of the estimated 25,000 to 35,000 miliciens for their collaboration. Many of those who escaped arrest fled to Germany, where they were incorporated into the Charlemagne Division of the Waffen SS. In the aftermath of France's defeat in June 1940, the overwhelming consensus was that Germany would win the war, and given the apparent inevitability of the Reich's victory, the widespread feeling was that resistance was futile. Resistance when it first began in the summer of 1940 was based upon what the writer Jean Cassou called refus absurde ("absurd refusal") of refusing to accept that the Reich would win and even if did, it was better to resist. Many résistants often spoke of some "climax" when they saw some intolerable act of injustice, after which they could not longer remain passive. The résistant Joseph Barthelet told the British SOE agent George Miller that his "climax" occurred when he saw the German military police march into the Feldgendarmerie in Metz a group of Frenchmen, one of whom was a friend. Barthelt recalled: "I recognized him only by his hat. Only by his hat, I tell you and because I was waiting on the roadside to see him pass. I saw his face all right, but there was no skin on it, and he could not see me. Both his poor eyes had been closed into two purple and yellow bruises". The résistant Henri Frenay who had initially sympathized with the Révolution nationale stated that when he saw the German soldiers in Paris in the summer of 1940, he knew he had do to something to uphold French honor because of the look of contempt he saw on the faces of the Germans when viewing the French. In August 1940, Freney founded Combat, one of the first Resistance groups. In the beginning, resistance was limited to activities such as severing phone lines, vandalizing posters and slashing tyres on German vehicles. Another form of resistance was underground newspapers like Musée de l'Homme (Museum of Mankind) which circulated clandestinely. The French intelligence service, the Deuxième Bureau stayed loyal to the Allied cause despite nominally being under the authority of Vichy; the Deuxième Bureau continued to collect intelligence on Germany, maintained links with British and Polish intelligence and kept the secret that before World War II that Polish intelligence had devised a method via a mechanical computer known as the Bombe to break the Enigma machine that was used to code German radio messages. A number of the Polish code-breakers who developed the Bombe machine in the 1930s continued to work for the Deuxième Bureau as part of the Cadix team breaking German codes. Right from the beginning the resistance attracted people from all walks of life and with diverse political views. A major problem for the Resistance was with the exception of a number of Army officers who chose to go underground together with veterans of the Spanish Civil War, none had any military experience. About 60, 000 Spanish Republican emigres fought in the Resistance. One of the first organized resistance groups founded in the summer of 1940 was the ill-fated Interallié group led by a Polish emigré Roman Czerniawski and a Frenchwoman Mathilde Carré codenamed La Chatte (the cat) that passed on intelligence from contacts in the Deuxième Bureau to Britain via courtiers from Marseilles. 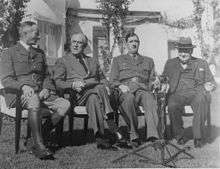 On 19 July 1940 the Special Operations Executive (SOE) was founded in Britain with orders from Churchill to "set Europe ablaze". The F Section of the SOE was headed by Maurice Buckmaster and provided invaluable support for the resistance. 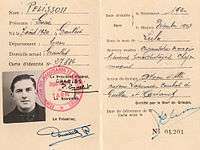 On 5 May 1941, the first SOE agent Georges Bégué landed in France in order to make contact with the resistance groups. The SOE provided weapons, bombs, false papers, money and radios to the resistance and the SOE agents were trained in guerrilla warfare, espionage and sabotage. The agents from the British SOE who were parachuted into France to help organize the resistance often complained about they considered to be the casual carelessness of the French groups when it came to security. A favorite tactic of the Gestapo and the Abwehr was to capture a résistant, "turn" him or her to their side and then sent the double agent out to infiltrate the resistance network. Numerous resistance groups were destroyed by such double agents, and the SOE often charged that the poor security arrangements of the French resistance groups left them wide open to being destroyed by one "turned" résistant. For example, the Interallié group was destroyed when Carré was captured and turned by the Abwehr in November 1941 as she betrayed everyone. On 22 June 1941, Germany launched Operation Barbarossa and invaded the Soviet Union. Following the appeal from the Comintern for a revolutionary war against Nazi Germany, the Parti Communiste Français (PCF) which until then had refused to engage in resistance swung into action. As the Communists were used to operating in secret, were tightly disciplined and a number of French Communists were veterans of the Spanish Civil War, they played a disproportionate role in the Resistance. On 21 August 1941, a French Communist Pierre Georges assassinated a German naval officer in the Paris Metro, which was the first time the resistance had killed a German. The German Military Governor General Otto von Stülpnagel announced on 22 August 1941 that for every German killed, he would execute at least ten innocent French people in retaliation and that all Frenchmen in German custody were now hostages. 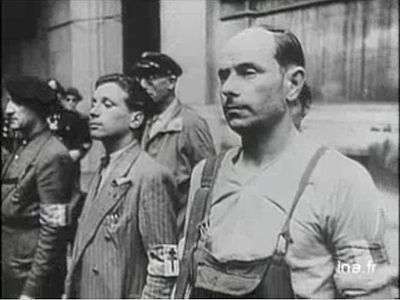 On 30 September 1941 Stülpnagel issued the "Code of Hostages" ordering all district chiefs to draw lists of hostages to be executed in the event of further "incidents" with a special emphasis on French Jews and people known for Communist or Gaullist sympathies. On 20 October 1941, Obersleutnant Karl Friedrich Hotz, the Feldkommandant of Nantes was assassinated on the streets of Nantes while the military lawyer Dr. Hans-Gottfried Reimers was assassinated in Bordeaux on 21 October. The Wehrmacht immediately shot 50 French people who had nothing to do with Hotz's assassination in retaliation in Nantes and announced if the assassin did not turn himself in by midnight of 23 October, another 50 would be shot. The assassin did not turn himself in and so another 50 hostages were shot. The same day, the Feldkommandant of Bordeaux had 50 French hostages shot in that city in retaliation for Reimers's assassination. The executions of hostages in Nantes and Bordeaux started a debate about the morality of assassination that lasted until the end of the occupation with many French people arguing that since the Germans were willing to shoot so many innocent people in reprisal for killing only one German that it was not worth it and others contending that to cease assassinations would mean giving in to German terror, that it would prove that terror worked and the Germans could brutally push the French around in their own country. General de Gaulle went on the BBC's French language service on 23 October to ask that PCF to call in their assassins, saying that killing one German would not change the outcome of the war one iota and that too many innocent people were being shot by Germans in reprisals. As the PCF did not recognize de Gaulle's authority, the Communist assassins continued their work under the slogan "an eye for an eye", and so the Germans continued to execute anywhere between 50–100 French hostages for every one of their numbers slain by the Communist assassins. As more and more resistance groups started to appear, it was agreed that more could be achieved by working together than apart, and the chief promoter of unification was a former préfet of Chartres Jean Moulin. After identifying the three largest resistance groups in the south of France that he wanted to see co-operate, Moulin decided to go to Britain to seek support. Moulin made a secret trip, visiting Lisbon on 12 September 1941 from where he traveled to London to meet General de Gaulle on 25 October 1941. De Gaulle named Moulin his representative in France and ordered him to return in unify all Resistance groups and to have them recognize the authority of de Gaulle's Free French National Committee in London, which very few resistance groups did at the time. To lend further support de Gaulle founded in October 1941 the BCRA (Bureau Central de Renseignements et d'Action -Central Office for Intelligence and Action) under André Dewavrin who used the code-name "Colonel Passy" to provide support for the Resistance. Through the BCRA was based in an office in Duke Street in London, it's relations with the SOE were often strained as de Gaulle made no secret of his dislike of British support for the resistance groups, which he saw as British meddling in France's domestic affairs. Tensions between Gaullist and non-Gaullist resistance groups led to the SOE dividing its F section into two with RF section providing support for Gaullist groups and the F section dealing with the non-Gaullist groups. In December 1941 after Germany declared war on the United States on 11 December 1941, the SOE was joined by the American Office of Strategic Services (OSS) in providing support for the resistance. On the night of 2 January 1942, Moulin flew parachuted into France secretly on a British plane with orders from de Gaulle to unify the resistance and to have all of the resistance accept his authority. On 1 May 1942, May Day, which Vichy had tried to turn into a Catholic holiday celebrating St. Philip, the Premier Pierre Laval was forced to break off his speech when the crowd began to chant "Mort à Laval". As millions of Frenchmen serving in the French Army had been prisoner by the Germans in 1940, there was a shortage of men in France during the Occupation, which explains why Frenchwomen played so a prominent role in the Resistance with the résistante Germaine Tillon later writing: “It was women who kick-started the Resistance.” In May 1942, speaking before a German military court in Lyon the résistante Marguerite Gonnet when asked about why she had taken up arms against the Reich replied: "Quite simply, colonel, because the men had dropped them." In 1942, the Royal Air Force (RAF) attempted to bomb the Schneider-Creusot works at Lyon, which was one of France's most largest arms factories. The RAF missed and instead killed about 1, 000 French civilians. Two Frenchmen serving in the SOE, Raymond Basset (codename Mary) and André Jarrot (codename Goujean) were parachuted in and were able to organise a series of sabotage attacks against the local power grid to sharply lower production at the Schneider-Creusot works. Freney, who had emerged as a leading résistant recruited the engineer Henri Garnier living in Toulouse to teach French workers at factories producing weapons for the Wehrmacht about how to best to alter the tolerance or making deviations of a few millimetres that could drastically shorten the lifespan of the Wehrmacht's weapons and better yet, such acts of quiet sabotage were almost impossible to detect, which meant no French people would be shot in reprisal. On 1 December 1942, a new resistance group the ORA (Organisation de Résistance de l'Armée-Army Resistance Organization) was founded. The Organisation de résistance de l'armée was headed by General Aubert Frère and recognized General Henri Giraud as France's leader. For a time in 1942–43, there were two rival leaders of the Free French movement in exile, namely General Giraud who was backed by the United States and General de Gaulle backed by Great Britain. For these reasons, the ORA had extremely bad relations with the Gaullist resistance while being favored by the OSS as the Americans did not want de Gaulle as France's postwar leader. On 26 January 1943, Moulin achieved success when he persuaded the three main resistance groups in the south of France, namely Franc-Tireur, Liberation and Combat to unite to form the MUR (Mouvements Unis de Résistance-United Resistance Movement) whose armed wing was the AS (Armée Secrète-Secret Army). The new MUR recognized General de Gaulle as the leader of France and selected General Charles Delestraint (codename Vidal) as the commander of the AS. Moulin followed this success by contracting resistance groups in the north of France like Ceux de la Résistance, Ceux de la Libération, Comité de Coordination de Zone Nord, and Libération Nord to ask if they were willing to join the MUR. Reflecting the growth of the Resistance, in January the Milice was created to hunt down the réstants, through initially that only one of the Milice's tasks, which was presented first as more an organisation to crack down on the black market. In February 1943, the Service du Travail Obligatoire (STO) organisation was created, requiring the call up of able-bodied French men to work in Germany. In the Reich, so many men had been called up for service with the Wehrmacht and the very sexist Nazi regime was reluctant to have German women work in factories as Hitler believed working damaged a woman's womb, so throughout the war the German state had a policy of bringing foreign workers to Germany to replace the men serving in the Wehrmacht. 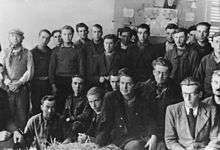 Under the law of 16 February 1943 all able-bodied Frenchmen aged 20-22 had to report to the STO to do two years labour in Germany. The so-called réfractaries attempted to avoid being called up for the STO and often went into hiding rather work in the Reich. At least 40,000 Frenchmen (80% of the resistance were people under the age of thirty) fled to the countryside, becoming the core of the marquis guerrillas. Those who fled into the countryside rejected the term réfractarie with its connotations of laziness and called themselves the marquis. By June 1943, the term marquis which had been a little known word borrowed from the Corsican dialect of Italian at the beginning of 1943 become widely known all over France. 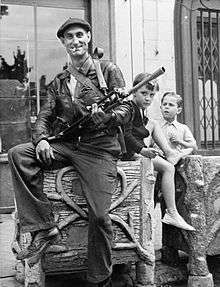 It was only in 1943 that guerilla warfare emerged in France as opposed to the more sporadic attacks against the Germans that had been going since the summer of 1941 and the resistance changed from an urban movement to a rural movement that was most active in central and southern France. The terrain of central and southern France with its forests, mountains, and shrubland were ideal for hiding and unless the authorities were prepared to commit thousands of men to hunt the marquis down, it was quite possible to evade authority in this landscape. The Germans simply did not have the spare men-power for such operations and instead sent spotter planes to find the marquis, who provided that they were careful about concealing their fires could usually avoid aerial detection. 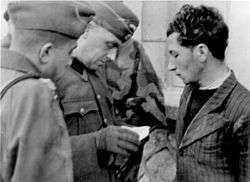 Joining the young men fleeing the service with the STO were others targeted by the Reich like Jews, Spanish Republican refugees, and Allied airmen shot down over France. The marquis bands that emerged in the countryside soon formed a sub-culture with its own slang, way of dressing and rules. To support themselves, the marquis took to theft with bank robbery and stealing from the Chantiers de Jeunesse (the Vichy youth movement) being especially favored means of obtaining money and supplies. As the marquis started to grow, the Milice was deployed to the countryside to hunt them down and the first milicien was killed in April 1943. As neither the marquis or the milice had many guns, the casualties were fairly low at first and by October 1943 the Milice had suffered only ten dead as result of its clashes with the marquis. The SOE soon made contact with the marquis bands, but however the SOE were unable to convince Whitehall until early 1944 that supplying the Resistance should be a priority. Until 1944, there were only 23 Halifax bombers committed to supplying Resistance groups for all of Europe, and many in the SOE preferred that resistance groups in Yugoslavia, Italy and Greece be armed rather than in France. On 26 March 1943, Moulin chaired in Paris a secret meeting attended by representatives of all the main resistance groups to form the CNR (Conseil National de la Résistence-National Council of the Resistance). The résistant René Hardy had been seduced by the Gestapo agent Lydie Bastien whose true loyalty was to her German lover Harry Stengritt and Hardy was arrested on 7 June 1943 when he walked into a trap laid by Bastien. After his arrest, Hardy was "turned" by the Gestapo as Bastien tearfully told him that she and her parents would all be sent to a concentration camp if he did not work for the Gestapo and Hardy, unaware that Bastien really loathed him and was only sleeping with him under Stengritt's orders agreed to work for the Gestapo. On 9 June 1943, General Delestraint was arrested by the Gestapo following a tip-off provided by the double agent Hardy and was sent to the Dachau concentration camp. On 21 June 1943, Moulin called a secret meeting in Lyon to discuss the crisis and try to find the traitor who betrayed Delestraint. At the meeting in Lyon, Moulin and the rest were arrested in person by SS-Hauptsturmführer Klaus Barbie, the "Butcher of Lyon". Barbie personally tortured Moulin, whose will was unbreakable and never talked despite being hit repeatedly by Barbie with a truncheon. Moulin was beaten into a coma and died on 8 July 1943 as a result of the brain damage he had suffered from the beatings inflicted by Barbie. In July 1943, the Royal Air Force attempted to bomb the Peugeot works at Sochaux, which manufactured tank turrets and engine parts for the Werhmacht. The RAF missed the Peugeot works and instead hit the neighborhood next to the factory, killing hundreds of French civilians. To avoid a repeat, the SOE agent Harry Rée contacted Rudolphe Peugeot to see if he was willing to sabotage his own factory. To prove that he was working for London, Rée informed Peugeot that the BBC's French language service would broadcast a message containing lines from a poem that Rée had quoted that night, and after hearing the poem in the BBC broadcast, Peugeot agreed to co-operate. Peugeot gave Rée the plans for the factory and suggested the best places to sabotage his factory without killing or injuring anyone by selectively placing plastic explosives. As a result, the Peugeot works were largely knocked out, and output never recovered. The Michelin family were approached with the same offer and declined. As a result, the RAF was called in and bombed the Michelin factory at Clermont-Ferrand – which was France's largest tyre factory and a major source of tyres for the Wehrmacht – into the ground. Despite the blow inflicted by Barbie, by 1 October 1943 the AS had grown to 241, 350 members, through most were still unarmed. For the most part, the AS refrained from armored operations as it was no match for the Wehrmacht. Instead the AS forced on preparing for Jour J when the Allies landed in France after which the AS would swing into action. In the meantime, the AS focused on training its members and conducing intelligence-gathering operations for the Allies. In October 1943, following a meeting between General Giraud and General de Gaulle in Algiers, orders went out for the AS and ORA to cooperate in operations against the Germans. On 29 December 1943, the AS and the main Communist group FTP agreed to co-operate whose actions were to controlled by the COMAC (Comité Militaire d'Action-Committee for Military Action) which in turn took its orders from the CNR. The Communists agreed for unity largely out of the belief that they would obtain more supplies from Britain this way, and in practice the FTP continued to go its own way. Despite the perennial shortage of arms, by the early 1944 there were parts of rural areas in the south of France that were more under the control of the marquis than the authorities. As the Resistance had not been informed of the details of Operation Overlord, many Resistance leaders had developed their own plans to have the marquis seize large parts of central and southern France, which provide a landing area for Allied forces to be known as "Force C" and supplies to be brought in, allowing "Force C" and the marquis to attack the Wehrmacht from the rear. The Supreme Headquarters of the Allied Expeditionary Force (SHEAF) had rejected this plan under the grounds that the disparity between the firepower and training of the Wehrmacht vs. the maquisards meant that the Resistance would be unable to hold their own in a sustained combat. The marquis unaware of this tried to seize "redoubts" several times in 1944 with disastrous results. Starting in late January 1944, a group of maquisards led by Théodose Morel (codename Tom) began to assemble on the Glières Plateau near Annecy in the Haute-Savoie. By February 1944, the maquisards numbered about 460 and had only light weapons, but received much media attention with the Free French issuing a press release in London saying "In Europe there are three countries resisting: Greece, Yugoslavia and the Haute-Savoie". The Vichy state sent the Groupes Mobiles de Réserve to evict the marquis from the Glières plateau and were repulsed. In March 1944, the Luftwaffe started to bomb the maquisards on the Glières plateau and on 26 March 1944 the Germans sent in an Alpine division and SS units together with about 1, 000 miliciens supported by artillery and air support which soon overwhelmed the maquisards whose lost about 150 killed in action and another 200 captured who were then shot. In February 1944, all of the Resistance governments agreed to accept the authority of the Free French government based in Algiers (until 1962 Algeria was considered to be part of France) and the Resistance was renamed FFI (Forces Françaises de l'Intérieur-Forces of the Interior). The Germans refused to accept the resistance as legitimate opponents and any résistant captured faced the prospect of torture and/or execution as the Germans maintained that the Hague and Geneva conventions did not apply to the resistance. By designating the resistance as part of the French armed forces was intended to provide the Resistance with legal protection and allow the French to threaten the Germans with the possibility of prosecution for war crimes. On 23 March 1944, General Pierre Koenig was appointed commander of the FFI and flew to London from Algiers to co-ordinate the operations of the FFI at the Supreme Headquarters of the Allied Expeditionary Force (SHEAF) commanded by General Dwight Eisenhower at a section known as État Major des Forces Françaises de l'Intérieur (General Staff, French Forces of the Interior). The American and British officers at SHEAF distrusted the Resistance with the OSS agent William J. Casey writing that many in the Resistance appeared more interested in post-war politics than in fighting the Germans. Despite the mistrust, SHEAF planned to use the Resistance to tie down German forces. 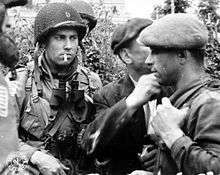 In the spring of 1944, a number of uniformed American, French and British soldiers known as "Jedburgh" teams were landed in France to make contact with the marquis guerillas. A Jedburgh team was a three men crew consisting of a commander, a deputy and a radio operator and one of the "Jeds" was always French with the other two being either British or American. In May 1944, there occurred another clash between the Germans and the marquis at Mont Mouchet when the marquis seized another "redoubt" which led to overwhelming force being brought to bear against them. Plan Vert-a systematic sabotage campaign to destroy the French railroad system. Plan Rouge-to attack and destroy all German ammunition dumps across France. Plan Bleu-to attack and destroy all power lines across France. Plan Violet-to attack and destroy phone lines in France. Plan Jaune-to attack German command posts. Plan Noir-to attack German fuel depots. Plan Tortue-to sabotage the roads of France. General de Gaulle himself was only informed by Churchill on 4 June 1944 that the Allies planned to land in France on 6 June and until then the Free French leaders had no idea when and where Operation Overlord was due to take place. On 5 June 1944, orders were given to activate Plan Violet. Of all the plans, Plan Violet was the most important in Operation Overlord for by destroying telephone lines and cutting underground cables forced the Germans to use their radios to communicate and as the code-breakers of Bletchley Park had broken many of the codes encrypted by the Enigma Machine, this gave a considerable advantage to the Allied generals. During the Normandy campaign, the Resistance was so effective in blowing up telephone lines and cables that the Wehrmacht and Waffen SS largely abandoned the French phone system as too unreliable and used the radio instead, thereby allowing Bletchley Park to listen in. On 9 June 1944 Eisenhower reached an agreement recognizing the FFI was part of the Allied order of battle and Koenig was operate under his command. A statement issued by de Gaulle declared the FFI was part of the French Army and resistance leaders were now all Army officers with those résistants commanding 30 men becoming sous-lieutenants; those commanding 100 becoming lieutenants; those commanding 300 were becoming capitaines; those commanding 1, 000 men becoming comandants and those commanding 2, 000 men becoming liuetenant-colonels. In a press communiqué issued on 12 June 1944, Field Marshal Gerd von Rundstedt declared that he did not recognize the FFI as part of the French Army and ordered the Wehrmacht to summary execute any Frenchman or Frenchwoman serving in the FFI. The other major Resistance operations were Plan Vert and Plan Tortue. In June 1944, the Resistance destroyed French railroads at 486 different points and by 7 June 1944, the day after D-Day, the Wehrmacht complained that due to sabotage that the main railroad lines between Avranches and St. Lô, between Cherbourg and St. Lô and between Caen and St. Lô were now out of action. As the Wehrmacht was forced to use the roads instead of railroads, Plan Tortue focused on ambushing the Wehrmacht and the Waffen SS as they travelled to the battlefields of Normandy. The marquis were joined in their guerrilla campaign by the Jedburgh teams, SOE agents, the "Operational Groups" of the OSS and by teams from British Special Air Service (SAS) regiment. The SAS commandos had jeeps armored with machine guns that they used to travel across French countryside and ambush German convoys. Usually, the marquis and their allies would cut down a tree to block a road in the wooded section of the French countryside, sometimes an anti-tank mine would be planted under the tree trunk and the Germans would be ambushed with machine gun and sniper fire when they attempted to remove the tree blocking the road. Such operations seriously delayed the Germans with the elite 2nd Waffen SS Division Das Reich taking 18 days to travel from Toulouse to Caen, a journey that was expected to take only three days. One Wehrmacht division transferred from the Eastern Front to the Western Front took a week to move from the Soviet Union to the borders of France and another three weeks to move from the French border to the Battle of Caen as Resistance attacks slowed down its movement. An estimate by SHAEF stated the Germans were moving at only 25% of their normal daily speed due to the constant attacks of the marquis all across France. On 23 June 1944, Koenig began to operate, giving orders to all the SOE and OSS agents via the Special Forces Headquarters. On 21 August 1944, Koenig was given command of the BCRA agents, the SOE's F section and RF section agents and the Jedburgh teams. The rejection of the "Force C" plan had not reached many of the marquis leaders operating out in the countryside and after the news of D-Day, the marquis attempted to seize "redoubts", most notably at the Vercors plateau. Through the Allies did try to fly in supplies to the "redoubts" and the marquis fought bravely, all these operations ended with the Resistance defeated. 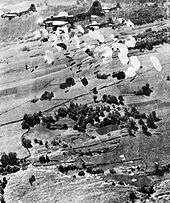 In the Battle of the Vercors Plateau, the SS landed a glider company and the marquis suffered very heavy losses. The French Résistance involved men and women representing a broad range of ages, social classes, occupations, religions and political affiliations. In 1942, one resistance leader claimed that the movement received support from four groups: the "lower middle" and "middle middle" classes, university professors and students, the entire working class and a large majority of the peasants. Resistance leader Emmanuel d'Astier de la Vigerie observed, in retrospect, that the Résistance had been composed of social outcasts or those on the fringes of society, saying "one could be a resister only if one was maladjusted." Although many, including d'Astier himself, did fit this description, most members of the Résistance came from traditional backgrounds and were "individuals of exceptional strong-mindedness, ready to break with family and friends" in order to serve a higher purpose. The question of how many were active in the Résistance has been raised. While stressing that the issue was sensitive and approximate, François Marcot, a professor of history at the Sorbonne, ventured an estimate of 200,000 activists and a further 300,000 with substantial involvement in Résistance operations. Historian Robert Paxton estimated the number of active resisters at "about 2% of the adult French population (or about 400,000)", and went on to observe that "there were, no doubt, wider complicities, but even if one adds those willing to read underground newspapers, only some two million persons, or around 10% of the adult population," had been willing to risk any involvement at all. The post-war government of France officially recognised 220,000 men and women. The doctrine of Gaullism was born during the Second World War as a French movement of patriotic resistance to the German invasion of 1940. Men of all political stripes who wanted to continue the fight against Adolf Hitler and who rejected the armistice concluded by Maréchal Philippe Pétain rallied to General Charles de Gaulle's position. As a consequence, on 2 August 1940, de Gaulle was condemned to death in absentia by the Vichy régime. Between July and October 1940, de Gaulle rejected the unconstitutional, repressive and racist laws instituted by Pétain, and established his own bona fides (good faith) as the principal defender of republican values. He asked, in his Appeal of 18 June 1940, that every patriot who could reach British territory should do so and join the Free French Army to fight in company with the Allies. The Free French forces also rallied the various French overseas colonies to fight back against the Vichy régime. His approval of this link between the Résistance and the colonials legitimised it. De Gaulle's influence grew in France, and by 1942 one resistance leader called him "the only possible leader for the France that fights". Other Gaullists, those who could not join Britain (that is, the overwhelming majority of them), remained in the territories ruled by Vichy and supported by soviet funds and weapons built networks of propagandists, spies and saboteurs to harass and discomfit the occupiers. Eventually, leaders of all of these separate and fragmented Résistance organizations were gathered and coordinated by Jean Moulin under the auspices of the National Council of Resistance (CNR), de Gaulle's formal link to the irregulars throughout occupied France. During the Italian campaign of 1943, 130,000 Free French soldiers fought on the Allied side and, by the time of the Normandy invasion, Free French forces numbered approximately half a million regulars and more than 100,000 French Forces of the Interior (FFI). The Free French 2nd Armored Division, under General Philippe Leclerc, landed in Normandy, and, in the waning days of summer 1944, led the drive toward Paris. The FFI in Normandy and the Île-de-France region surrounding Paris began to harass German forces intensively, cutting roads and railways, setting ambushes and fighting conventional battles alongside their allies. The Free French 2nd Armored Division rolled ashore in Normandy on 1 August 1944, and served under General Patton's Third Army. The division played a critical role in Operation Cobra, the Allies' "breakout" from its Normandy beachhead, where it served as a link between American and Canadian armies and made rapid progress against German forces. The 2nd Armored all but destroyed the 9th Panzer Division and mauled several other German units as well. During the battle for Normandy this German division lost 133 killed, 648 wounded and 85 missing. The division's matériel losses included 76 armored vehicles, seven cannons, 27 halftracks and 133 other vehicles. The most celebrated moment in the unit's history involved the liberation of Paris. Allied strategy emphasized destroying German forces retreating towards the Rhine, but when the French Résistance under Colonel Rol staged an uprising in the city, Charles de Gaulle pleaded with General Eisenhower to send help. Eisenhower agreed, and Leclerc's forces headed toward Paris. After hard fighting that cost the 2nd Division 35 tanks, 6 self-propelled guns and 111 vehicles, Dietrich von Choltitz, the military governor of Paris, surrendered the city in a ceremony at the Hotel Meurice. Jubilant crowds greeted the French forces, and de Gaulle led a renowned victory parade through the city. De Gaulle not only kept the patriotic resistance alive; he also did everything possible to re-establish the French claim to independence and sovereignty. As a leader, the American and British governments preferred the less popular, but less abrasively vindictive, General Giraud to de Gaulle, but for the French population de Gaulle was almost universally recognised as the true leader in their victory. These events forced Roosevelt to recognise, finally and fully, the provisional government installed in France by de Gaulle. After the signing of the Molotov–Ribbentrop Pact and the outbreak of World War II in 1939, the French Communist Party (PCF) was declared a proscribed organisation by Édouard Daladier's government. Many of its leaders were arrested and imprisoned or forced to go underground. The PCF adopted an antiwar position on orders of the Comintern in Moscow, which remained in place for the first year of the German occupation, reflecting the September 1939 nonaggression pact between Germany and the USSR. Conflicts erupted within the party, as many of its members opposed collaboration with the Germans while others toed the party line of neutrality as directed by Stalin in Moscow. On Armistice Day, November 11, 1940, communists were among the university students demonstrating against German repression by marching along the Champs-Élysées. It was only when Germany invaded the Soviet Union in 1941 that French communists actively began to organize a resistance effort. They benefited from their experience in clandestine operations during the Spanish Civil War. On 21 August 1941, Colonel Pierre-Georges Fabien committed the first overt violent act of communist resistance by assassinating a German officer at the Barbès-Rochechouart station of the Paris Métro. The attack, and others perpetrated in the following weeks, provoked fierce reprisals, culminating in the execution of 98 hostages after the Feldkommandant of Nantes was shot on 20 October. The military strength of the communists was still relatively feeble at the end of 1941, but the rapid growth of the Francs-Tireurs et Partisans (FTP), a radical armed movement, ensured that French communists regained their reputation as an effective anti-fascist force. The FTP was open to non-communists but operated under communist control, with its members predominantly engaged in acts of sabotage and guerrilla warfare. By 1944, the FTP had an estimated strength of 100,000 men. Towards the end of the occupation the PCF reached the height of its influence, controlling large areas of France through the Résistance units under its command. Some in the PCF wanted to launch a revolution as the Germans withdrew from the country, but the leadership, acting on Stalin's instructions, opposed this and adopted a policy of cooperating with the Allied powers and advocating a new Popular Front government. Many well-known intellectual and artistic figures were attracted to the Communist party during the war, including the artist Pablo Picasso and the writer and philosopher Jean-Paul Sartre. Philosophers Georges Politzer and Valentin Feldman and writer Jacques Decour were among others. After the German invasion of the USSR, many Russian white émigrés, inspired by Russian patriotic sentiment, would support the Soviet war effort. A number of them formed the Union of Russian Patriots, which adopted pro-Soviet positions and collaborated closely with the French Communist Party. At the end of the summer of 1940, Daniel Mayer was asked by Leon Blum to reconstitute the SFIO (in ruins because of Paul Faure's defection to the Vichy regime). In March 1941 Daniel Mayer created, with other socialists like Suzanne Buisson and Félix Gouin, the Comité d'action socialiste (CAS) in Nîmes. The same thing was created by Jean-Baptiste Lebas in the Nord-Pas-de-Calais (administratively joined with Belgium) in January 1941, along the lines of a prior network created in September 1940. In 1942, Le Populaire, newspaper of the SFIO from 1921 to 1940, was publishing again, clandestinely. The same year, André Philip became commissaire national à l'Intérieur of the Free French (France libre), and Félix Gouin joined Charles de Gaulle in London to represent the socialists. In Algeria, left-wing networks of resistance were already formed. As the Riom trial began in 1942, the fervour and the number of socialists in the Resistance grew. The CAS-Sud became the secret SFIO in March 1943. There was a majority from the SFIO in Libération-Nord, one of the eight great networks to make up the National Council of the Resistance, and in the Brutus network. Socialists were also important in the organisation civile et militaire and in Libération-Sud. Other socialist leaders in the Resistance included Pierre Brossolette, Gaston Defferre, Jean Biondi, Jules Moch, Jean Pierre-Bloch, Tanguy-Prigent, Guy Mollet and Christian Pineau. François Camel and Marx Dormoy were assassinated, while Jean-Baptiste Lebas, Isidore Thivrier, Amédée Dunois, Claude Jordery and Augustin Malroux died during their deportation. Before the war, there were several ultrarightist organisations in France including the monarchist, antisemitic and xenophobic Action Française. 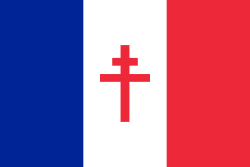 Another among the most influential factions of the right was Croix-de-Feu (Cross of Fire), which gradually moderated its positions during the early years of the war and grew increasingly popular among the aging veterans of the First World War. Despite some differences in their positions on certain issues, these organizations were united in their opposition to parliamentarism, a stance that had led them to participate in demonstrations, most notably the "political disturbance" riots of 6 February 1934. At about the same time, La Cagoule, a fascist paramilitary organisation, launched various actions aimed at destabilising the Third Republic; these efforts continued until La Cagoule could be infiltrated and dismantled in 1937. Like the founder of Action Française, Charles Maurras, for whom the collapse of the Republic was famously acclaimed as a "divine surprise", thousands not only welcomed the Vichy régime but collaborated with it to one degree or another, but the powerful appeal of French nationalism drove others to engage in resistance against the occupying German forces. In 1942, after an ambiguous period of collaboration, the former leader of Croix de Feu, François de La Rocque, founded the Klan Network, which provided information to the British intelligence services. Georges Loustaunau-Lacau and Marie-Madeleine Fourcade, who had both supported La Cagoule, founded the Alliance network, and Colonel Groussard, of the Vichy secret services, founded the Gilbert network. Some members of Action Française engaged in the Résistance with similar nationalistic motives. Some prominent examples are Daniel Cordier, who became Jean Moulin's secretary, and Colonel Rémy, who founded the Confrérie Notre-Dame. These groups also included Pierre de Bénouville, who, together with Henri Frenay, led the Combat group, and Jacques Renouvin, who founded the group of resisters known as Liberté. Sometimes contact with others in the Résistance led some operatives to adopt new political philosophies. Many gradually moved away from their antisemitic prejudices and their hatred of 'démocrassouille', 'dirty democracy' (which many equated with mob rule), or simply away from their traditional grass-roots conservatism. Bénouville and Marie-Madeleine Fourcade became députés in the French parliament after the war; François Mitterrand moved towards the left and joined the Résistance, Henri Frenay evolved towards European socialism, and Daniel Cordier, whose family had supported Maurras for three generations, abandoned his views in favor of the ideology of the republican Jean Moulin. The historian Jean-Pierre Azéma coined the term vichysto-résistant to describe those who at first supported the Vichy regime (mostly based on the patriotic image of Pétain rather than the Révolution Nationale) but later joined the Résistance. The founder of Ceux de la Libération ("Those of the Liberation"), Maurice Ripoche, initially defended Vichy but soon placed the liberation of France above all other goals and in 1941 opened his movement to leftists. In contrast, many extreme right-wing members of the Résistance, such as Gabriel Jeantet and Jacques Le Roy Ladurie, never renounced their tolerant attitudes towards Vichy. The Affiche Rouge (red placard) was a famous propaganda poster distributed by the Vichy French and German authorities in the spring of 1944 in occupied Paris. It was intended to discredit a group of 23 Franc-Tireurs known as the "Manouchian group". After its members were arrested, tortured and publicly tried, they were executed by firing squad in Fort Mont-Valérien on 21 February 1944. The poster emphasised the composition of the group's membership, many of whom were Jews and communists, to discredit the Résistance as not "French" enough in its fundamental allegiance and motivations. 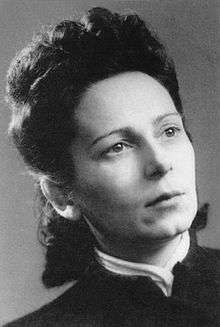 Ariadna Scriabina, (daughter of Russian composer Alexander Scriabin), co-founded the Armée Juive and was killed by the pro-Nazi milice in 1944. She was posthumously awarded the Croix de guerre and Médaille de la Résistance. The Vichy régime had legal authority in both the north of France, which was occupied by the German Wehrmacht; and the southern "free zone", where the régime's administrative centre, Vichy, was located. Vichy voluntarily and willfully collaborated with Nazi Germany and adopted a policy of persecution towards Jews, demonstrated by the passage of antisemitic legislation as early as October 1940. The Statute on Jews, which legally redefined French Jews as a non-French lower class, deprived them of citizenship. According to Philippe Pétain's chief of staff, "Germany was not at the origin of the anti-Jewish legislation of Vichy. That legislation was spontaneous and autonomous." The laws led to confiscations of property, arrests and deportations to concentration camps. As a result of the fate promised them by Vichy and the Germans, Jews were over-represented at all levels of the French Résistance. Studies show that although Jews in France constituted only 1% of the French population, they comprised ~ 15–20% of the Résistance. Among these were many Jewish émigrés, such as Hungarian artists and writers. The Jewish youth movement Eclaireuses et Eclaireurs israélites de France (EEIF), equivalent to Boy Scouts and Girl Scouts in other countries, had, during the early years of the occupation, shown support for the Vichy regime's traditional values, until it was banned in 1943, after which its older members soon formed armed resistance units. A militant Jewish Zionist resistance organisation, the Jewish Army (Armée Juive), was founded in 1942. It was established and led by Abraham Polonski, Eugénie Polonski, Lucien Lublin, David Knout and Ariadna Scriabina (daughter of the Russian composer Alexander Scriabin). They continued armed resistance under a Zionist flag until liberation finally arrived. The Armée juive organised escape routes across the Pyrenées to Spain, and smuggled about 300 Jews out of the country during 1943–44. They distributed millions of dollars from the American Joint Distribution Committee to relief organisations and fighting units within France. In 1944, the EIF and the Jewish Army combined to form the Organisation Juive de Combat (OJC). The OJC had four hundred members by the summer of 1944, and participated in the liberations of Paris, Lyon, Toulouse, Grenoble and Nice. In the southern occupation zone, the Œuvre de Secours aux Enfants (roughly, Children's Relief Effort), a French-Jewish humanitarian organisation commonly called OSE, saved the lives of between seven and nine thousand Jewish children by forging papers, smuggling them into neutral countries and sheltering them in orphanages, schools and convents. The Armenian community of France played an active role in the Résistance. Armenian poet and communist Missak Manouchian became one of the leaders of the French Résistance and commander of the Manouchian Group (the family of Charles Aznavour had supported Missak and his wife Meliné when they were in hiding). Arpen Tavitian, another executed member of the Manouchian group, industrialist Napoléon Bullukian (1905–1984), poets Kégham Atmadjian (1910–1940) and Rouben Melik were other famous participants in the French Résistance. The Anti-Fascist Underground Patriotic Organization was also commanded by Armenian officiers. Armenian-French writer Luiza Aslanean (Louise Aslanian) (1906–1945), another French Résistance activist, was arrested among with her husband in 1944, taken to the Ravensbrück concentration camp by Nazis and killed in 1944. Many of her manuscripts and diaries were confiscated by Nazis. Resisters Alexander Kazarian and Bardukh Petrosian were awarded by the highest military orders of France by General Charles de Gaulle. Henri Karayan (1921–2011), a member of the Manouchian Group, participated in illegal distribution of L'Humanité in Paris and was engaged in armed struggle until the Libération. In 2012, 95-year-old Arsene Tchakarian, the last survivor of the Manouchian resistance group who fought against occupying Nazi German forces during the Second World War, was decorated as Officer of the Legion of Honour by the president of France. 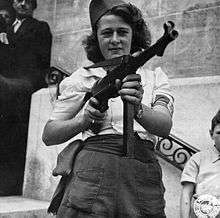 "Nicole Minet", a French Partisan who captured 25 Nazis in the Chartres area (August 1944). Mothers of France, our native land, yours is the most difficult task but also the most gratifying. You are, even before the state, the true educators. You alone know how to inspire in all [our youth] the inclination for work, the sense of discipline, the modesty, the respect, that give men character and make nations strong. Despite opposing the collaborationist regime, the French Résistance generally sympathised with its antifeminism and did not encourage the participation of women in war and politics, following, in the words of historian Henri Noguères, "a notion of inequality between the sexes as old as our civilisation and as firmly implanted in the Résistance as it was elsewhere in France". Consequently, women in the Résistance were less numerous than men and averaged only 11% of the members in the formal networks and movements. Not all of the women involved in the Résistance were confined to subordinate roles. Intellectuals like Germaine Tillion and Suzanne Hiltermann-Souloumiac, highly aware of the signification of Nazism and collaboration were among the few early resistants. Suzanne Hiltermann-Souloumiac played an important role in the Dutch-Paris movement, specialised in rescuing allied pilots. Lucie Aubrac, the iconic resister and co-founder of Libération-Sud, was never assigned a specific role in the hierarchy of the movement. Hélène Viannay, one of the founders of Défense de la France and married to a man who shared her political views, was never permitted to express her opinions in the underground newspaper, and her husband took two years to arrive at political conclusions she had held for many years. Marie-Madeleine Fourcade, the only female leader in the Résistance, headed the Alliance network. The Organisation Civile et Militaire had a female wing headed by Marie-Hélène Lefaucheux, who took part in setting up the Œuvre de Sainte-Foy to assist prisoners in French jails and German concentration camps. But no women were chosen to lead any of the eight major Résistance movements. After the liberation of France, the provisional government appointed no women ministers or commissaires de la République. In this context, it is customary to distinguish the various organisations of the French Résistance as movements or networks. A Résistance network was an organisation created for a specific military purpose, usually intelligence-gathering, sabotage or aiding Allied air crews who had been shot down behind enemy lines. A Résistance movement, on the other hand, was focused on educating and organising the population, i.e., "to raise awareness and organise the people as broadly as possible." Of the nearly 2,000 volunteers who were active by the end of the war, one of the most effective and well-known was the agent Gilbert Renault, who was awarded the Ordre de la Libération and later the Legion of Honour for his deeds. Known mainly by the pseudonym Colonel Rémy, he returned to France in August 1940 not long after the surrender of France, where the following November he organised one of the most active and important Résistance networks of the BCRA, the Confrérie de Notre Dame (Brotherhood of Our Lady), which provided the Allies with photographs, maps and important information on German defences in general and the Atlantic Wall in particular. From 1941 on, networks such as these allowed the BCRA to send armed paratroopers, weapons and radio equipment into France to carry out missions. Mouvements Unis de la Résistance (Unified Movements of the Resistance, MUR) was a French Résistance organisation resulting from the regrouping of three major Résistance movements ("Combat", "Franc-Tireur" and "Libération-Sud") in January 1943. Later that year, the BCRA and the United Movements of Résistance merged their intelligence networks. Another BCRA appendage was called Gallia, a fact-gathering network specialising in military intelligence and police activities. Its importance increased throughout the second half of 1943 and into the spring of 1944. It eventually became the largest BCRA network in the Vichy zone, employing about 2,500 sources, contacts, couriers and analysts. Gallia's work did not stop after the 1944 landings in Normandy and Provence; it provided information to the Allies that allowed for the bombing of the retreating German armies' military targets. Dutch-Paris built an important network in France to help resistants, Jews and allied pilots to cross the Pyrenees and flee to Britain. 800 Jews and 142 pilots were saved. Near the end of the war, because of a denunciation, nearly all members of the network were caught and deported to concentration camps, where many died. Following their defeat in the Spanish Civil War in early 1939, about half a million Spanish Republicans fled to France to escape imprisonment or execution. On the north side of the Pyrenees, such refugees were confined in internment camps such as Camp Gurs and Camp Vernet. Although over half of these had been repatriated to Spain (or elsewhere) by the time Pétain proclaimed the Vichy Régime in 1940, the 120,000 to 150,000 who remained became political prisoners, and the foreign equivalent to the Service du Travail Obligatoire, the Compagnies de Travailleurs Étrangers (Companies of Foreign Workers) or CTE, began to pursue them for slave labour. The CTE permitted prisoners to leave the internment camps if they agreed to work in German factories, but as many as 60,000 Republicans recruited for the labour service managed to escape and join the French Résistance. Thousands of suspected anti-fascist Republicans were deported to German concentration camps instead, however. Most were sent to Mauthausen where, of the 10,000 Spaniards registered, only 2,000 survived the war. Many Spanish escapees joined French Résistance groups; others formed their own autonomous groups which became known as the Spanish maquis. In April 1942, Spanish communists formed an organisation called the XIV Corps, an armed guerrilla movement of about 3,400 combatants by June 1944. Although the group first worked closely with the Francs-Tireurs et Partisans (FTP), it re-formed as the Agrupación de Guerrilleros Españoles (Spanish Guerrilla Group, AGE) in May 1944. The name change was intended to convey the group's composition: Spanish soldiers ultimately advocating the fall of General Francisco Franco. After the German Army had been driven from France, the Spanish maquis refocused on Spain. Among Czechs and Slovaks who joined the French Résistance were Otakar Hromádko, Věra Waldes and Artur London. From spring 1943, German and Austrian anti-fascists who had fought in the International Brigades during the Spanish Civil War fought in Lozère and the Cévennes alongside the French Résistance in the Francs-Tireurs et Partisans. During the first years of the occupation they had been employed in the CTE, but following the German invasion of the southern zone in 1942 the threat increased and many joined the maquis. They were led by militant German communist Otto Kühne, a former member of the Reichstag in the Weimar Republic who had over 2,000 Germans in the FTP under his command by July 1944. He fought the Nazis directly, as in an April 1944 battle in Saint-Étienne-Vallée-Française in which his soldiers destroyed a Feldgendarmerie unit, or in an ambush of the Waffen-SS on June 5, 1944. 400 men from Luxembourg (which was annexed into Germany), many of whom had refused to serve in, or who had deserted from, the German Wehrmacht, left their tiny country to fight in the French maquis, where they were particularly active in the regions of Lyon, Grenoble and the Ardennes although many of them were killed in the war. Others, like Antoine Diederich, rose to high rank in the Résistance. Diederich, known only as "Capitaine Baptiste", had 77 maquis soldiers under his command and is best known for attacking Riom prison, where he and his fighters freed every one of 114 inmates who had been sentenced to death. Many Hungarian émigrés, some of them Jewish, were artists and writers working in Paris at the time of the occupation. They had gone to Paris in the 1920s and 1930s to escape repression in their homeland. Many joined the Résistance, where they were particularly active in the regions of Lyon, Grenoble, Marseille and Toulouse. Jewish resisters included Imre Epstein in the Hungarian group at Toulouse; György Vadnai (future Lausanne rabbi) at Lyon; the writer Emil Szittya at Limoges. Also participating were the painter Sándor Józsa, the sculptor István Hajdú (Étienne Hajdu), the journalists László Kőrös and Imre Gyomrai; the photographers Andor (André) Steiner, Lucien Hervé and Ervin Martón. Tamás Elek (1924–1944), Imre Glasz (1902–1944) and József Boczor (1905–1944) were among 23 resisters executed for their work with the legendary Manouchian Group. The Germans executed nearly 1,100 Jewish resisters of different nationalities during the occupation, while others were killed in action. On 3 March 1943, representatives of the Italian Communist Party and Italian Socialist Party who had taken refuge in France, signed the "Pact of Lyon" which marked the beginning of their participation in the Résistance. Italians were particularly numerous in the Hitler-annexed Moselle industrial area, where they played a determining role in the creation of the Département's main resistance organisation, Groupe Mario. Vittorio Culpo is an example of Italians in the French Resistance. The majority of the Polish soldiers, and some Polish civilians, who stayed in France after the German victory in 1940, as well as one Polish pilot shot down over France (one of many Polish pilots flying for the RAF), joined the French Résistance, notably including Tony Halik and Aleksander Kawałkowski. While not part of the French Résistance, French-speaking Cajun soldiers in the United States military posed as local civilians in France to channel American assistance to the Résistance. From 1940 to 1942, the first years of the German occupation of France, there was no systematically organised Résistance capable of coordinated fighting throughout France. Active opposition to the German and Vichy authorities was sporadic, and carried out only by a tiny and fragmented set of operatives. Most French men and women put their faith in the Vichy government and its figurehead, Marshal Pétain, who continued to be widely regarded as the "savior" of France, opinions which persisted until their unpopular policies, and their collaboration with the foreign occupiers, became broadly apparent. The earliest Résistance organisations had no contact with the western Allies, and received no material aid from London or anywhere else. Consequently, most focused on generating nationalist propaganda through the distribution of underground newspapers. Many of the major movements, such as Défense de la France, were centred around their newspapers. Even after they became more intensively activist, propaganda and the cultivation of positive morale remained, until the very end of the war, their most important concerns. Early acts of violent resistance were often motivated more by instinct and fighting spirit than by any formal ideology, but later several distinct political alignments and visions of post-liberation France developed among the Résistance organisations. These differences sometimes resulted in conflicts, but the differences among Résistance factions were usually papered over by their shared opposition to Vichy and the Germans; and over time, the various elements of the Résistance began to unite. Many of the networks recruited and controlled by the British and Americans were not perceived by the French as particularly interested in establishing a united or integrated Résistance operation, and the guerrilla groups controlled by the communists were only slightly more attracted by the idea of joining of a Résistance "umbrella" organisation. Nonetheless, a contact between de Gaulle's envoys and the communists was established at the end of 1942. The liberation of Corsica in September 1943, a clear demonstration of the strength of communist insurgency, was accomplished by the FTP, an effective force not yet integrated into the Secret Army and not involved with General Henri Giraud, the Free French or the political unification of the Résistance. The French Résistance began to unify in 1941. This was evidenced by the formation of movements in the Vichy zone centred on such figures as Henri Frenay (Combat), Emmanuel d'Astier de la Vigerie (Libération-Sud) and François de Menthon, (Liberté), each of whom was, independently, an agent of the Free French. Formal consolidation was accomplished through the intervention of Jean Moulin. Prefect of Eure-et-Loir in 1939, Moulin was subsequently a part of the Air Ministry of Pierre Cot. In this context, he had forged a strong network of relationships in anti-fascist circles. Some time after November 1940, the idea of teaming up with his former colleague, Gaston Cusin, to identify and contact a number of potential Résistance "centres of influence" occurred to him; but only during the summer of 1941 was he able to make the most critical contacts, including contact with Henri Frenay, leader of the movement not yet called Combat but still known as the National Liberation Movement. He also established contact with de Menthon and Emmanuel d'Astier. In the report he wrote for de Gaulle, he spoke of these three movements and entertained the possibility of bringing them together under the acronym "LLL". The Maquis (French pronunciation: ​[maˈki]) were rural guerrilla bands of French Resistance fighters, called maquisards, during the Occupation of France in World War II. Initially, they were composed of men who had escaped into the mountains to avoid conscription into Vichy France's Service du travail obligatoire (STO) to provide forced labor for Nazi Germany. To avert capture and deportation to Germany, they became increasingly organized into non-active resistance groups. The majority of resistance movements in France were unified after Moulin's formation of the Conseil National de la Résistance (CNR) in May 1943. CNR was coordinated with the Free French forces under the authority of French Generals Henri Giraud and Charles de Gaulle and their body, the Comité Français de Libération Nationale (CFLN). By June 1941, 81% of the miners of the national coal mining company, Charbonnages de France, were on strike, slowing deliveries of coal to German industrial plants supporting the war effort. The first action of many Résistance movements was the publication and distribution of clandestine press material. This was not the case with all movements, since some refused civil action and preferred armed resistance by groups such as CDLR and CDLL. Most clandestine newspapers were not consistent in their editorial stance and often consisted of only a single sheet, because the sale of all raw materials –- paper, ink, stencils –- was prohibited. By 1942, however, about 300,000 copies of underground publications reached around two million readers. Resistance workers used friendly print-shop facilities at night. Staff risked the Germans noticing that a resistance newspaper used the same type face as officially sanctioned documents. Profession-specific newspapers also existed. Le Médecin Français advised doctors to immediately approve known collaborators for Service du travail obligatoire while medically disqualifying everyone else. La Terre advised farmers on how to send food to resistance members. Bulletin des Chemins de Fer encouraged railroad workers to sabotage German transportation. Unter Uns ("Among Us"), published in German for the occupiers, printed stories of German defeats on the eastern front. In September 1940, Agnès Humbert and Jean Cassou, then employed at the Musée national des Arts et Traditions Populaires in Paris and finding they were to be replaced by German-approved staff, used a roneo machine belonging to the Museum to publish an open letter by Paul Rivet to Marshal Pétain. This was followed by their first tract, Vichy fait la guerre ('Vichy wages war'), written by Cassou. At the end of 1940, a group of 10, including Humbert, Cassou, Marcel Abraham and Claude Aveline founded a clandestine newsletter called Résistance, respecting and supporting De Gaulle but circumspect in references to "that ridiculous old fool Pétain". It ran to five issues before the arrest of the editors in March 1940. In the northern zone, Pantagruel, the newspaper of Franc-Tireur, had a circulation of 10,000 by June 1941 but was quickly replaced by Libération-Nord which attained a circulation of 50,000, and by January 1944 Défense de la France was distributing 450,000 copies. In the southern zone, François de Menthon's newspaper Liberté merged with Henri Frenay's Vérité to form Combat in December 1941, which grew to a circulation of 200,000 by 1944. During the same period Pantagruel brought out 37 issues, Libération-Sud 54 and Témoignage chrétien 15. The underground press brought out books as well as newspapers through publishing houses, such as Les Éditions de Minuit (the Midnight Press), which had been set up to circumvent Vichy and German censorship. The 1942 novel Le Silence de la Mer ("The Silence of the Sea"), by Jean Bruller, quickly became a symbol of mental resistance through its story of how an old man and his niece refused to speak to the German officer occupying their house. The intelligence networks were by far the most numerous and substantial of Résistance activities. They collected information of military value, such as coastal fortifications of the Atlantic Wall or Wehrmacht deployments. The BCRA and the different British intelligence services often competed with one another to gather the most valuable information from their Résistance networks in France. The first agents of the Free French to arrive from Britain landed on the coast of Brittany as early as July 1940. They were Lieutenants Mansion, Saint-Jacques and Corvisart and Colonel Rémy, and didn't hesitate to get in touch with the anti-Germans within the Vichy military such as Georges Loustaunau-Lacau and Georges Groussard. The various Résistance movements in France had to understand the value of intelligence networks in order to be recognized or receive subsidies from the BCRA or the British. The intelligence service of the Francs-Tireurs et Partisans was known by the code letters FANA and headed by Georges Beyer, the brother-in-law of Charles Tillon. Information from such services was often used as a bargaining chip to qualify for airdrops of weapons. The transmission of information was first done by radio transmitter. Later, when air links by the Westland Lysander became more frequent, some information was also channeled through these couriers. By 1944, the BCRA was receiving 1,000 telegrams by radio every day and 2,000 plans every week. Many radio operators, called pianistes, were located by German goniometers. Their dangerous work gave them an average life expectancy of around six months. Even children partook in radio work (see Eddy Palacci). According to the historian Jean-François Muracciole, "Throughout the war, how to communicate remained the principal difficulty of intelligence networks. Not only were the operators few and inept, but their information was dangerous." Sabotage was a form of resistance adopted by groups who wanted to go beyond just distributing clandestine press publications. Many laboratories were set up to manufacture explosives. In August 1941, the Parisian chemist France Bloch-Sérazin assembled a small laboratory in her apartment to provide explosives to communist Résistance fighters. The lab also produced cyanide capsules to allow the fighters to evade torture if arrested. Indeed, she herself was arrested in February 1942, tortured, and deported to Hamburg where she was beheaded by guillotine in February 1943. In the southern occupation zone, Jacques Renouvin engaged in the same activities on behalf of groups of francs-tireurs. Stealing dynamite from the Germans eventually took preference over handcrafting explosives. The British Special Operations Executive also parachuted tons of explosives to its agents in France for essential sabotage missions. The railways were a favorite target of saboteurs, who soon understood that removing bolts from the tracks was far more efficient than planting explosives. Train-derailment strategies varied considerably in their effectiveness. The Germans managed to repair the tracks quickly in agricultural areas with level ground, since the salvage of some matériel was a relatively easy proposition in such terrain. But unbolting a connector plate on an outside rail in a mountainous area (given the higher speed of trains going downhill) could result in the derailment of an entire train with considerable amounts of front-ready matériel strewn far down the mountainside. Among the SNCF employees who joined the resistance, a subset were in Résistance-Fer which focused on reporting the movement of German troops to the Allied forces and sabotaging the railways' rolling stock as well as their infrastructure. Following the invasions of Normandy and Provence in 1944, the sabotage of rail transport became much more frequent and effectively prevented some German troop deployments to the front and hindered the subsequent retreat of German occupying forces. Generally, the sabotage of equipment leaving armaments factories and derailment in areas where equipment could not readily be salvaged was a more discreet form of resistance, and probably at least as effective as bombing. Available Allied military aircraft was far less vulnerable as well, and so could provide combat support. It was also preferred since it caused less collateral damage and fewer civilian casualties than Allied bombing. After the invasion of the Soviet Union in June 1941, communists engaged in guerrilla warfare, attacking German forces in French cities. In July 1942, the Allies' failure to open a second front resulted in a wave of communist guerrilla attacks aimed at maximizing the number of Germans deployed in the West to give the USSR military relief. The assassinations that took place during summer and autumn 1941, starting with Colonel Pierre-Georges Fabien's shooting of a German officer in the Paris Métro, caused fierce reprisals and executions of hundreds of French hostages. As a result, the clandestine press was very discreet about the events and the communists soon decided to discontinue the assassinations. From July to October 1943, groups in Paris engaging in attacks against occupying soldiers were better organized. Joseph Epstein was assigned responsibility for training Résistance fighters across the city, and his new commandos of fifteen men perpetrated a number of attacks that could not have been carried out before. The commandos were drawn from the foreign branch of the Francs-Tireurs et Partisans, and the most famous of them was the Manouchian Group. Defining the precise role of the French Résistance during the German occupation, or assessing its military importance alongside the Allied Forces during the liberation of France, is difficult. The two forms of resistance, active and passive, and the north-south occupational divide, allow for many different interpretations, but what can broadly be agreed on is a synopsis of the events which took place. Following the surrender of Fascist Italy in September 1943, a significant example of Résistance strength was displayed when the Corsican Résistance joined forces with the Free French to liberate the island from General Albert Kesselring's remaining German forces. On mainland France itself, in the wake of the D-Day landings in Normandy in June 1944, the FFI and the communist fighting groups FTP, theoretically unified under the command of General Pierre Kœnig, fought alongside the Allies to free the rest of France. Several color-coded plans were co-ordinated for sabotage, most importantly Plan Vert (Green) for railways, Plan Bleu (Blue) for power installations and Plan Violet (Purple) for telecommunications. To complement these missions, smaller plans were drafted: Plan Rouge (Red) for German ammunition depots, Plan Jaune (Yellow) for German command posts, Plan Noir (Black) for German fuel depots and Plan Tortue (Tortoise) for road traffic. Their paralysis of German infrastructure is widely thought to have been very effective. British Prime Minister Winston Churchill later wrote in his memoirs praising the role the Résistance played in the liberation of Brittany, "The French Resistance Movement, which here numbered 30,000 men, played a notable part, and the peninsula was quickly overrun." The Liberation of Paris on August 25, 1944, with the support of Leclerc's French 2nd Armored Division, was one of the most famous and glorious moments of the French Résistance. Although it is again difficult to gauge their effectiveness precisely, popular anti-German demonstrations, such as general strikes by the Paris Métro, the gendarmerie and the police, took place, and fighting ensued. The liberation of most of southwestern, central and southeastern France was finally fulfilled with the arrival of the 1st French Army of General de Lattre de Tassigny, which landed in Provence in August 1944 and was backed by over 25,000 maquis. Throughout France, the Free French had been of inestimable value in the campaign. They were particularly active in Brittany, but on every portion of the front we secured help from them in a multitude of ways. Without their great assistance, the liberation of France and the defeat of the enemy in Western Europe would have consumed a much longer time and meant greater losses to ourselves. General Eisenhower also estimated the value of the Résistance to have been equal to ten to fifteen divisions at the time of the landings. (One infantry division comprised about ten thousand soldiers.) Eisenhower's statements are all the more credible since he based them on his GHQ's formal analyses and published them only after the war, when propaganda was no longer a motive. Historians still debate how effective the French Résistance was militarily, but the neutralization of the Maquis du Vercors alone involved the commitment of over 10,000 German troops within the theater, with several more thousands held in reserve, as the Allied invasion was advancing from Normandy and French Operation Jedburgh commandos were being dropped nearby to the south to prepare for the Allied landing in Provence. It is estimated that FFI killed some 2,000 Germans, a low estimate based on the figures from June 1944 only. Estimates of the casualties among the Résistance are made harder by the dispersion of movements at least until D-Day, but credible estimates start from 8,000 dead in action, 25,000 shot and several tens of thousands deported, of whom 27,000 died in death camps. For perspective, the best estimate is that 86,000 were deported from France without racial motive, overwhelmingly comprising resistance fighters and more than the number of Gypsies and Jews deported from France. Tribute to SNCF personnel killed during the Second World War in Metz railway station. Immediately following the liberation, France was swept by a wave of executions, public humiliations, assaults and detentions of suspected collaborators, known as the épuration sauvage (savage purge). This period succeeded the German occupational administration but preceded the authority of the French Provisional Government, and consequently lacked any form of institutional justice. Approximately 9,000 were executed, mostly without trial as summary executions, notably including members and leaders of the pro-Nazi milices. In one case, as many as 77 milices members were summarily executed at once. An inquest into the issue of summary executions launched by Jules Moch, the Minister of the Interior, came to the conclusion that there were 9,673 summary executions. A second inquest in 1952 separated out 8,867 executions of suspected collaborators and 1,955 summary executions for which the motive of killing was not known, giving a total of 10,822 executions. Head-shaving as a form of humiliation and shaming was a common feature of the purges, and between 10,000 and 30,000 women accused of having collaborated with the Germans or having had relationships with German soldiers or officers were subjected to the practice, becoming known as les tondues (the shorn). Women accused of collaboration with their heads shaved. The official épuration légale ("legal purge") began following a June 1944 decree that established a three-tier system of judicial courts: a High Court of Justice which dealt with Vichy ministers and officials; Courts of Justice for other serious cases of alleged collaboration; and regular Civic Courts for lesser cases of alleged collaboration. Over 700 collaborators were executed following proper legal trials. This initial phase of the purge trials ended with a series of amnesty laws passed between 1951 & 1953 which reduced the number of imprisoned collaborators from 40,000 to 62, and was followed by a period of official "repression" that lasted between 1954 & 1971. During this period, and particularly after de Gaulle's return to power in 1958, the collective memory of "Résistancialisme" tended toward a highly-resistant France opposed to the collaboration of the Vichy regime. This period ended when the aftermath of the events of May 1968, which had divided French society between the conservative "war generation" and the younger, more liberal students and workers, led many to question the Résistance ideals promulgated by the official history. In coming to terms with the events of the occupation, several different attitudes have emerged in France, in an evolution the historian Henry Rousso has called the "Vichy Syndrome". The questioning of France's past had become a national obsession by the 1980s, fuelled by the highly publicized trials of war criminals such as Klaus Barbie and Maurice Papon. Although the occupation is often still a sensitive subject in the early 21st century, contrary to some interpretations the French as a whole have acknowledged their past and no longer deny their conduct during the war. After the war, the influential French Communist Party (PCF) projected itself as "Le Parti des Fusillés" (The Party of Those Shot), in recognition of the thousands of communists executed for their Résistance activities. The number of communists killed was in reality considerably less than the Party's figure of 75,000, and it is now estimated that close to 30,000 Frenchmen of all political movements combined were shot, of whom only a few thousand were communists. The Vichy Regime's prejudicial policies had discredited traditional conservatism in France by the end of the war, but following the liberation many former Pétainistes became critical of the official résistancialisme, using expressions such as "la mythe de la Résistance" (the myth of the Résistance), one of them even concluding, "The 'Gaullist' régime is therefore built on a fundamental lie." The French Résistance has had a great influence on literature, particularly in France. 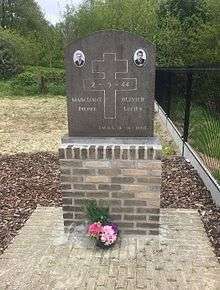 A famous example is the poem "Strophes pour se souvenir", which was written by the communist academic Louis Aragon in 1955 to commemorate the heroism of the Manouchian Group, whose 23 members were shot by the Nazis. The Résistance is also portrayed in Jean Renoir's wartime This Land is Mine (1943), which was produced in the USA. In the immediate postwar years, French cinema produced a number of films that portrayed a France broadly present in the Résistance. La Bataille du rail (1946) depicted the courageous efforts of French railway workers to sabotage German reinforcement trains, and in the same year Le Père tranquille told the story of a quiet insurance agent secretly involved in the bombing of a factory. Collaborators were unflatteringly portrayed as a rare unpopular minority, as played by Pierre Brewer in Jéricho (also 1946) or Serge Reggiani in Les Portes de la nuit (1946 as well), and movements such as the Milice were rarely evoked. In the 1950s, a less heroic interpretation of the Résistance to the occupation gradually began to emerge. 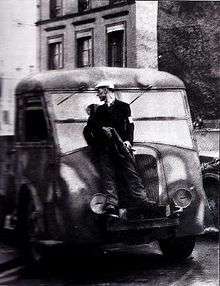 In Claude Autant-Lara's La Traversée de Paris (1956), the portrayal of the city's black market and the prevailing general mediocrity disclosed the reality of war-profiteering during the occupation. In the same year, Robert Bresson presented A Man Escaped, in which an imprisoned Résistance activist works with a reformed collaborator inmate to help him escape. A cautious reappearance of the image of Vichy emerged in Le Passage du Rhin (The Crossing of the Rhine)(1960), in which a crowd successively acclaims both Pétain and de Gaulle. After General de Gaulle's return to power in 1958, the portrayal of the Résistance returned to its earlier résistancialisme. In this manner, in Is Paris Burning? (1966), "the role of the resistant was revalued according to [de Gaulle's] political trajectory". The comic form of films such as La Grande Vadrouille (also 1966) broadened the image of Résistance heroes in the minds of average Frenchmen. The most famous and critically acclaimed of all the résistancialisme movies is L'armée des ombres (Army of Shadows) by French filmmaker Jean-Pierre Melville in 1969, a film inspired by Joseph Kessel's 1943 book as well as Melville's own experience as a Résistance fighter who participated in Operation Dragoon. A 1995 television screening of L'armée des ombres described it as "the best film made about the fighters of the shadows, those anti-heroes." The shattering of France's résistancialisme following the civil unrest of May 1968 was made particularly clear in French cinema. The candid approach of the 1971 documentary The Sorrow and the Pity shone a spotlight on antisemitism in France and disputed the official Résistance ideals. Time magazine's positive review of the film wrote that director Marcel Ophüls "tries to puncture the bourgeois myth —- or protectively skew memory -— that allows France generally to act as if hardly any Frenchmen collaborated with the Germans." Franck Cassenti, with L'Affiche Rouge (1976); Gilson, with La Brigade (1975); and Mosco with the documentary Des terroristes à la retraite addressed foreign resisters of the EGO, who were then relatively unknown. In 1974, Louis Malle's Lacombe, Lucien caused scandal and polemic for his lack of moral judgment regarding the behavior of a collaborator. Malle later portrayed the resistance of Catholic priests who protected Jewish children in his 1987 film Au revoir, les enfants. François Truffaut's 1980 film Le Dernier Métro was set during the German occupation of Paris and won ten Césars for its story of a theatrical production staged while its Jewish director is concealed by his wife in the theater's basement. The 1980s began to portray the resistance of working women, as in Blanche et Marie (1984). Later, Jacques Audiard's Un héros très discret (1996) told the story of a young man's traveling to Paris and manufacturing a Résistance past for himself, suggesting that many heroes of the Résistance were impostors. In 1997 Claude Berri produced the biopic Lucie Aubrac based on the life of the Résistance heroine of the same name, which was criticized for its Gaullist portrayal of the Résistance and its overemphasizing the relationship between Aubrac and her husband. The well-known personalities of France – intellectuals, artists, and entertainers – faced a serious dilemma in choosing to emigrate or to remain in France during the country's occupation. They understood that their post-war reputations would depend, in large part, on their conduct during the war years. Most who remained in France aimed to defend and further French culture and thereby weaken the German hold on occupied France. Some were later ostracized following accusations that they had collaborated. Among those who actively fought in the Resistance, a number died for it – for instance the writer Jean Prévost, the philosopher and mathematician Jean Cavaillès, the historian Marc Bloch, and the philosopher Jean Gosset; among those who survived and went on to reflect on their experience, a particularly visible one was André Malraux. Among prominent foreign figures who participated in the French Résistance was the political scientist and later Iranian Prime Minister Shapour Bakhtiar. After serving as the prime minister and strong man of the authoritarian Shah regime in Iran, he was forced back into Paris in the aftermath of the Islamic Revolution. He was assassinated on order of the Iranian Islamic Republic in 1991. ↑ Lieb, Peter. "Wehrmacht, Waffen-SS et Sipo/SD : La répression allemande en Ireland 1943–1944" (PDF). Retrieved 2011-03-07. ↑ Crowdy, Terry French Resistance Fighter France's Secret Army, London: Opsrey 2007 page 15. ↑ Crowdy, Terry French Resistance Fighter France's Secret Army, London: Opsrey 2007 page 12. ↑ Crowdy, Terry French Resistance Fighter France's Secret Army, London: Opsrey 2007 page 13. ↑ Crowdy, Terry French Resistance Fighter France's Secret Army, London: Opsrey 2007 page 14. ↑ Crowdy, Terry French Resistance Fighter France's Secret Army, London: Opsrey 2007 page 10. ↑ Crowdy, Terry French Resistance Fighter France's Secret Army, London: Opsrey 2007 pages 10–11. ↑ Crowdy, Terry French Resistance Fighter France's Secret Army, London: Opsrey 2007 page 11. ↑ Crowdy, Terry French Resistance Fighter France's Secret Army, London: Opsrey 2007 page 16. ↑ Crowdy, Terry French Resistance Fighter France's Secret Army, London: Opsrey 2007 pages 13–14. ↑ Shakespeare, Nicholas (4 September 2015). "The truth behind the French Resistance". The Daily Telegraph. Retrieved 2008-05-29. ↑ Crowdy, Terry French Resistance Fighter France's Secret Army, London: Opsrey 2007 page 48. ↑ Crowdy, Terry French Resistance Fighter France's Secret Army, London: Opsrey 2007 page 17. ↑ Crowdy, Terry French Resistance Fighter France's Secret Army, London: Opsrey 2007 page 18. ↑ Ousby, Ian Occupation The Ordeal of France, 1940–1944, New York: Cooper Square Press, 2000 pages 267-268. ↑ Ousby, Ian Occupation The Ordeal of France, 1940–1944, New York: Cooper Square Press, 2000 page 251. ↑ Ousby, Ian Occupation The Ordeal of France, 1940–1944, New York: Cooper Square Press, 2000 page 253. ↑ Ousby, Ian Occupation The Ordeal of France, 1940–1944, New York: Cooper Square Press, 2000 page 254. ↑ Ousby, Ian Occupation The Ordeal of France, 1940–1944, New York: Cooper Square Press, 2000 pages 254-255. ↑ Crowdy, Terry French Resistance Fighter France's Secret Army, London: Opsrey 2007 page 29. ↑ Ousby, Ian Occupation The Ordeal of France, 1940–1944, New York: Cooper Square Press, 2000 page 257. ↑ Ousby, Ian Occupation The Ordeal of France, 1940–1944, New York: Cooper Square Press, 2000 page 259. ↑ Ousby, Ian Occupation The Ordeal of France, 1940–1944, New York: Cooper Square Press, 2000 pages 261-262. ↑ Ousby, Ian Occupation The Ordeal of France, 1940–1944, New York: Cooper Square Press, 2000 pages 268-269. ↑ Ousby, Ian Occupation The Ordeal of France, 1940–1944, New York: Cooper Square Press, 2000 page 269. ↑ Crowdy, Terry French Resistance Fighter France's Secret Army, London: Opsrey 2007 pages 29 & 32. ↑ Crowdy, Terry French Resistance Fighter France's Secret Army, London: Opsrey 2007 page 32. ↑ Coleman, Julian (13 June 1999). "How a French beauty betrayed Jean Moulin". The Daily Telegraph. Retrieved 2016-11-30. ↑ Crowdy, Terry French Resistance Fighter France's Secret Army, London: Opsrey 2007 page 21. ↑ Ousby, Ian Occupation The Ordeal of France, 1940–1944, New York: Cooper Square Press, 2000 pages 282-283. ↑ Crowdy, Terry French Resistance Fighter France's Secret Army, London: Opsrey 2007 page 54. ↑ Ousby, Ian Occupation The Ordeal of France, 1940–1944, New York: Cooper Square Press, 2000 page 283. ↑ Crowdy, Terry French Resistance Fighter France's Secret Army, London: Opsrey 2007 page 22. ↑ Crowdy, Terry French Resistance Fighter France's Secret Army, London: Opsrey 2007 pages 21-22. ↑ Crowdy, Terry French Resistance Fighter France's Secret Army, London: Opsrey 2007 page 55. ↑ Crowdy, Terry French Resistance Fighter France's Secret Army, London: Opsrey 2007 page 50. ↑ Crowdy, Terry French Resistance Fighter France's Secret Army, London: Opsrey 2007 pages 50-51. ↑ Crowdy, Terry French Resistance Fighter France's Secret Army, London: Opsrey 2007 page 51. ↑ Crowdy, Terry French Resistance Fighter France's Secret Army, London: Opsrey 2007 pages 51-52. ↑ Crowdy, Terry French Resistance Fighter France's Secret Army, London: Opsrey 2007 page 52. ↑ Crowdy, Terry French Resistance Fighter France's Secret Army, London: Opsrey 2007 page 53. 1 2 deRochemont, Richard (1942-08-24). "The French Underground". Life. p. 86. Retrieved November 20, 2011. ↑ This expression has been used by many of Azéma's colleagues, notably Robert Belot in La Résistance sans De Gaulle, Fayard, 2006, and Henry Rousso in L'Express n° 2871, 13 July 2006. 1 2 Art Proscrit, Exposition (April–August 2010), Holocaust Memorial Center (Budapest), Mardi Hongrois Blog (in French), 12 April 2010. Retrieved 29 August 2010. ↑ "Jewish Resistance Groups and Leaders". The American-Israeli Cooperative Enterprise. Retrieved 6 March 2013. ↑ Rosen, Philip E. Dictionary of the Holocaust : Biography, Geography, & Terminology. Westport, Connecticut, USA: Greenwood Publishing Group, Incorporated, 1997. p 13. ↑ Order of the Liberation. "Gilbert Renault". Archived from the original on November 6, 2007. Retrieved 2008-01-04. ↑ Art in Exile series: Belated Homecoming, Works by Edit Bán Kiss, Béla Mészöly Munkás, Zsigmond Wittmann, 17 Apr – 15 August 2010, Holocaust Memorial Center (HDKE), Budapest. Retrieved 3 September 2010. ↑ LPB – Mon Cher Camarade, Louisiana Public Broadcasting, 10 September 2009. Retrieved 27 May 2011. ↑ Breuer, William B. (2000). Top Secret Tales of World War II. Wiley. pp. 131–134. ISBN 0-471-35382-5. ↑ Marsura, Evelyne. "Combien y a-t-il eu de déportés en France?". Retrieved 2011-03-07. ↑ (French) Henri Amouroux, 'La justice du Peuple en 1944', Académie des Sciences Morales et Politiques, 9 Jan 2006. ↑ "Truth and Consequences". TIME magazine. March 27, 1972. Retrieved 2007-12-14. 1 2 Federini, Fabienne (2006). Ecrire ou combattre : Des intellectuels prennent les armes (1942–1944). Paris: Editions La Découverte. ISBN 2-7071-4825-3. Ariès, Phillippe; Duby, Georges (1998). A History of Private Life, Volume V, Riddles of Identity in Modern Times. Cambridge, Massachusetts & London: Belknap Press. ISBN 978-0-674-40004-7. Booth, Owen; Walton, John (1998). The Illustrated History of World War II. London: Brown Packaging Books Ltd. ISBN 978-0-7858-1016-2. Brès, Evelyne; Brès, Yvan (2007). Un maquis d'antifascistes allemands en France (1942–1944). Languedoc: Les Presses du Languedoc. ISBN 978-2-85998-038-2. Conan, Eric; Rousso, Henry (1998). Vichy: An Ever-Present Past. Sudbury, Massachusetts: Dartmouth. ISBN 978-0-87451-795-8. Duchen, Claire; Bandhauer-Schoffmann, Irene (2000). When the War Was over: Women, War and Peace in Europe, 1940–1956. London & New York: Continuum International Publishing Group. ISBN 978-0-7185-0180-8. Ezra, Elizabeth; Harris, Sue (2000). France in Focus: Film and National Identity. Oxford: Berg Publishers. ISBN 978-1-85973-368-4. L.F. Ellis; G. R. G. Allen; A. E. Warhurst (2004). Victory in the West: The Battle of Normandy. United Kingdom: Naval & Military Press Ltd. ISBN 978-1-84574-058-0. Gassend, Jean-Loup (2014). Autopsy of a Battle, the Allied Liberation of the French Riviera. Atglen PA: Schiffer. ISBN 9780764345807. Godin, Emmanuel; Chafer, Tony (2004). The French Exception. New York: Berghahn Books. ISBN 978-1-57181-684-9. Kedward, Harry R; Wood, Nancy (1995). The Liberation of France: Image and Event. Oxford: Berg Publishers. ISBN 978-1-85973-087-4. Mendras, Henri; Cole, Alistair (1991). Social Change in Modern France: Towards a Cultural Anthropology of the Fifth Republic. Cambridge, UK: Cambridge University Press. ISBN 978-0-521-39108-5. Mercier, Marie Helen; Despert, J. Louise. "Psychological Effects of the War on French Children" (PDF). French Authorities. Retrieved 2007-12-15. Moran, Daniel; Waldron, Arthur (2002). The People in Arms: Military Myth and National Mobilization since the French Revolution. Cambridge, UK: Cambridge University Press. ISBN 978-0-521-81432-4. Roy, Pinaki. "Vagissements A Partir D' un Terrain Occupe". Labyrinth (Ed. Mishra, L.) (ISSN 0976-0814) 3(2), April 2012: 26–39. Sweets, John F. (1976). The Politics of Resistance in France, 1940–1944 : A History of the Mouvements Unis de la Résistance. DeKalb: Northern Illinois University Press. ISBN 978-0-87580-061-5. Resistance, TV series created by TF1 in France (as Résistance) and broadcast in UK on More4 in 2015. The French Resistance features in the novel Villa Normandie by Kevin Doherty. Wikimedia Commons has media related to French resistance.